George Orwell famous novel Animal Farm will be presented in a Bahasa Malaysia stage play called Kandang. Here is an interview with the director Omar Ali in theSun today. Power corrupts, and absolute power corrupts absolutely. That’s the premise of George Orwell’s novel Animal Farm, first published in 1945. Director Omar Ali will be presenting this wonderful piece of literature in Bahasa Malaysia, in a stage production entitled Kandang. Both he and his father, author Tan Sri Muhammad Ali Hashim, painstakingly translated the work into the national language. This political satire will take place at the Kuala Lumpur Performing Arts (klpac) from Aug 10 to 13, featuring a cast that includes Ashraf Zain, Farah Rani, Joe Chin, Clarence Kuna, and Faez Malek, among others. The story centres on Old Major, a prize-winning boar, who gathers the animals of the Manor Farm for a meeting in the big barn. He tells them of a dream he has, in which all animals live together in a land with no humans to oppress them. He believes all animals should be treated equally. Old Major later dies, the animals decide to come together and make his dream a reality. They manage to drive out the owner of Manor Farm, Mr Jones, and rename the property Animal Farm.Initially, the animals are able to create a paradise on Animal Farm.But slowly, the animals start to oppress one another, and equality becomes a forgotten vision. “I love the fact that the author used animals as allegory [for] humans,” says 34-year-old Omar. This inspired the title of his play – Kandangliterally means ‘cage’. “My goal is to examine and analyse what this word means and represents,” said Omar. 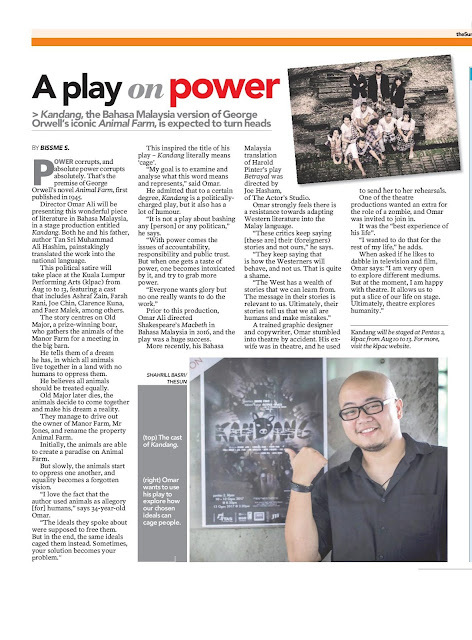 He admitted that to a certain degree, Kandang is a politically-charged play, but it also has a lot of humour. “It is not a play about bashing any [person] or any politican,” he says. “With power comes the issues of accountability, responsibility and public trust. But when one gets a taste of power, one becomes intoxicated by it, and try to grab more power. Prior to this production, Omar Ali directed Shakespeare’s Macbeth in Bahasa Malaysia in 2016, and the play was a huge success. More recently, his Bahasa Malaysia translation of Harold Pinter’s play Betrayal was directed by Joe Hasham, of The Actor’s Studio.Omar strongly feels there is a resistance towards adapting Western literature into the Malay language. “These critics keep saying [these are] their (foreigners) stories and not ours,” he says. A trained graphic designer and copywriter, Omar stumbled into theatre by accident. His ex-wife was in theatre, and he used to send her to her rehearsals. One of the theatre productions wanted an extra for the role of a zombie, and Omar was invited to join in. It was the “best experience of his life”. “I wanted to do that for the rest of my life,” he adds.